Sutherland Hospital implemented a new procurement process, to provide staff with efficient access to products that deliver safe patient care in the right place, at the right time. View a poster from the Centre for Healthcare Redesign graduation, December 2017. To reduce expired stock in pilot wards by 100 per cent, by 31 December 2017. To increase staff satisfaction by providing clarity around roles, making it easier to locate stock and reducing the time taken to order stock, by 31 December 2017. To reduce the value of excess stock by 80 per cent, by 31 December 2017. To reduce expenditure of goods and services within the scope of the project, by 15 per cent by 31 December 2017. Reduces the time taken for nurses to order and locate stock, so they can spend more time with patients. Improves patient safety by eliminating the risk of using expired sterile stock. Provides appropriate and tidy storage for sterile stock management, with clear labelling of stock locations. Improves financial efficiency, by reducing excess stock and expenditure on stock. Allows administrative and ward staff to help with the stock ordering process. Sutherland Hospital aims to continually improve its financial performance, while minimising harm to patients and maintaining high-quality clinical care. The management of stock inventory is essential to the timely delivery of safe and effective healthcare. However, prior to the project there was a lack of governance around inventory management and procurement. Sutherland Hospital held an average of $10,000 worth of stock on its shelves at any time, which represented more than two weeks stock for 77 per cent of all items and $200,000 worth of stock across the hospital. This was considered excessive and financially inefficient. In addition, each area of the hospital ordered, reconciled and stored stock differently, which led to wastage, inefficiencies and variations in ordering practices. There was also a culture of ordering stock ‘just in case’ instead of ‘just in time’. This resulted in expired stock on shelves, unavailable stock and nursing staff who were taken away from patient care to order or locate stock. The lack of procedural guidelines, education and clearly-defined roles also negatively affected staff morale. It was determined that by addressing procurement practices, Sutherland Hospital would be able to improve patient care and hospital length of stay, while reducing the risk of clinical incidents due to unavailable or expired stock. Staff roles were formally defined, so that responsibilities were aligned to appropriate positions. For example, administration staff were responsible for ordering stock, ward staff were responsible for delivering and unpacking stock, nursing unit managers (NUMs) were responsible for managing inventory and nursing staff were responsible for retrieving stock for patients. The project team educated staff on the changes at ward meetings and held regular walk throughs, to familiarise staff with the new layout. Comprehensive training was also undertaken with administrative staff and store persons. An electronic dashboard of purchasing data was developed for circulation among NUMs each month. This aimed to increase awareness of the amount of existing stock in pilot wards, to ensure excess ordering did not occur. A new ordering process was developed, allowing administration staff to order stock directly from the barcodes and labels on the shelf. Instead of the barcode book which required a two-step process, the team placed colour-coded labels on the shelves, which facilitated visual stock management, minimum-maximum ordering and the ability to order direct from the shelf. This reduced the ordering process to one simple step, which saved time and improved the accuracy of stocktake. Prior to the project, wards were stocking 33 specialty dressing items for wound care. Cleanse wards were allocated a basic dressing inventory of 11 multi-use dressings, and a centralised dressing bank was created for specialty dressings. This was placed in a central location with the wound care clinical nurse coordinator, providing staff with timely access to specialty dressings and eliminating the need for wards to stock expensive dressings that were infrequently used. A policy on access to the dressing bank was developed and distributed to staff across the hospital. Sterile stock management guidelines require sterile stock to be stored in dustproof shelving. 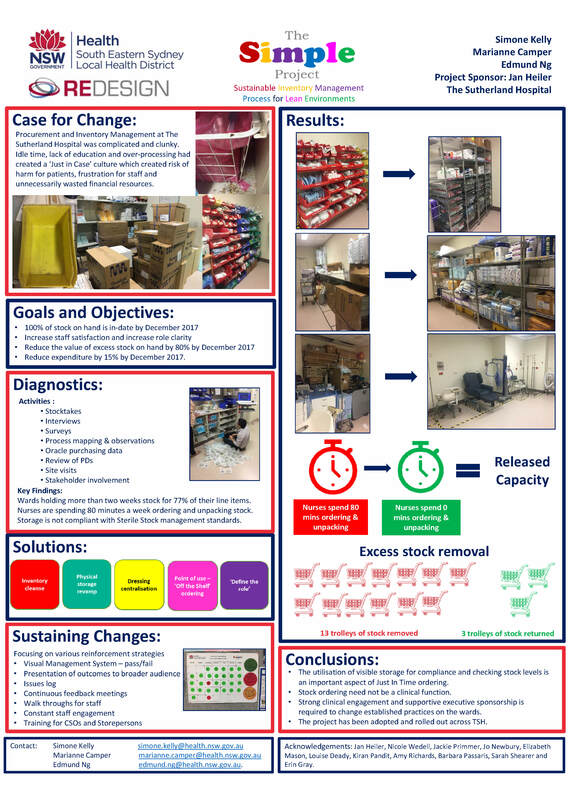 As existing shelving did not meet this standard, compliant shelving was installed in the pilot wards with clear labelling, making it easier to clean, maintain and locate stock. compliance with the new ordering process, measured by the removal of the barcode book and regular storage inspections. Engaging clinicians and sponsors is critical to implementing new processes and managing change. Addressing any resistance openly and honestly allows the team to address concerns throughout the project. Remember that more storage creates more space to fit more stock. Less is more. It is important to make incremental changes rather than burdening teams with a number of new processes at once.